Our countertop guide aims to help make your countertop replacement one of the most exciting projects you will be a part of as the owner of a home in Maryland, DC, or Virginia. You will be given seemingly endless choices on options such as countertop materials, textures, colors, and edge designs. Although the home renovation process can seem like a frustrating process – just think of all the rewards you’ll reap. The rewards gained will be plentiful, not just in terms of the quality time that you will spend with your family around your new countertops,but also in relation to your return on investment. Our countertop guide tips will help you select the perfect countertop for your home. The first step in choosing your new countertop is determining your budget. Doing this will help you better decide which type of material that you can afford. Countertop products and materials are generally priced per square foot. Each square foot can vary anywhere between $5 and $300. It is possible that there will be materials that do not fit in your budget. If this turns out to be the case, consider that there are many available countertop options that are less expensive while still looking magnificent. Take your time shopping around for your new countertop. Guide your efforts so that you eventually consider all the available options. Look at the various displays and samples so you can gather an idea of what color and texture suits your tastes. Take those samples and compare them to your existing kitchen fixtures: cabinets, flooring,painted walls etc. – this will help to give you more concrete idea of how your new countertops will compliment the existing décor of your kitchen. Once you determine the color you like, you will need to start thinking about choosing a countertop material. This countertop guide will detail each of the most popular countertop choices and their features. These include the following:granite, laminate, marble, solid surface, engineered stone (Quartz), soapstone and finally, concrete countertops. For more in-depth information about each of the various types of countertop materials we have available please visit our Products Page. If you’re looking for specific features and characteristics in your countertops, this chart can help you decide between our vast array of options. Shine Granite Contact your local quarry for more information. Deep, Rich Colors Soapstone Contact your local quarry for more information. Now that you have used our countertop guide to decide on your colors, materials,edge treatment and backsplash, it’s now time to schedule an appointment with a qualified installers. Once an appointment is scheduled, the installer will take a variety of accurate measurements of your current countertops. The installer will then create a template out of craft paper and we will then be able to use that template to custom-build your countertops. The custom design work needed for the cutouts required for sinks and cook tops are measured on-site during countertop installation. After all the measurements for your new countertops have been taken, your personal installer will talk with you about a convenient time to set up an appointment for your countertop installation. You will need to set aside a whole day for installation. The installation will make your kitchen unusable for a period of time that could range from a few hours to an entire day. The time needed for the installation will depend on the size and the difficulty of your installation. Countertop Guide Tip: It is recommended that you clean out your bottom cabinets before installation of your new countertops begins. That way, you can ensure that none of your belongings are damaged or dirtied in any way during your countertop installation. After installation is completed, the contractor will remove the debris and will then inspect the new countertop for any visible or structural flaws. It is vital that you are present for this process because the installer will most likely address topics of regular care and maintenance as well as warranties that accompany and/or are available for your product. Most installers will take the liberty of disposing your old countertops. Countertop Guide Tip: Make sure these services are included in the overall fees before you hire your contractor to avoid unforeseen costs. Click here for tips on hiring a contractor for installation. If you would like more information that is not included in our countertop guide or have additional questions please don’t hesitate to contact us at Express Countertops. 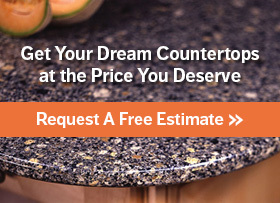 You can call us at 410-712-0601 or you can use the estimate button above to request your free estimate and have your new countertops installed in 1 week – GUARANTEED!